Bugger me it's hot already! Hot and heavy, today, like there's going to be a thunder storm although Meteo France gives no mention of one. This morning I sat and sweated at the local flea market with my fwend C. I shouldn't have been there, I should have been at the mountain bike competition at Laudun but my eldest who is accident prone when it comes to bikes, squashed his foot against the pavement yesterday and is now one of the walking wounded. So my youngest went off with another dad, and I stayed home and was thus able to sit and sweat at the flea market. I took 2 items to sell, and sold... neither. Not surprising really seeing as there were very few people walking around, and this was not surprising seeing as there had been hardly any advertising done. Only locals knew about it, and they are not necessarily the ones who want to buy their neighbours' crap. I had a mooch around the stalls but saw nothing that grabbed me as a 'must have' item. Anyway, I'm on an economy drive after paying for my teeth, and anticipating paying for the repairs on my car. I had a call from the garage on Friday with a quote for new parts. It made me laugh, so the guy asked me if it was what I was expecting to pay. Not quite... it was equivalent to the value of the car! No, I want to pay MUCH less than that! So I've borrowed an old 205 and am well grateful to have it, but it is a tad old and mucky. To make it look like an action car, I've fixed the bike rack to it. Now it looks like I use it to do interesting outdoor stuff like have adventures. My youngest has taken to going off on adventures. He dons his combat coat, plastic safety glasses, a WWI plastic 'tin' helmet, packs a sarnie and some water into a backpack and goes off with the walkie talkie and a rifle slung over his shoulder. Every now and then, he calls in to give his position, the position of the enemy and ask for instructions. It's quite hilarious, but he does it perfectly seriously. Sometimes he takes his pal, and sometimes he goes off on his bike. A free spirit, that one. This evening it's cooled down, thank goodness. We may be in for a scorching summer! Well I only went to kiss my friend CS and her family who had told me they were there, and they aslo asked if they could put one or two little things for me on their stad, having sent their daughter round to help me carry my little bag of goodies. 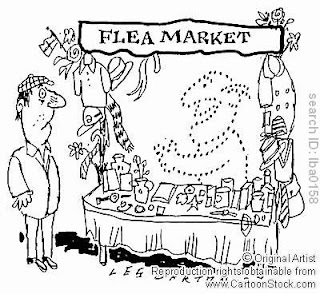 Sold quite a fex little things, and what was left, my friend CS is going to take to another flea market...kind. I did not know that your friend C was going to be there until I saw her, with u on the stand. Not many people were there, but at least I sold for about 20 euros, and C will selle the rest later. Well I just went to kiss my friend C.S. et her family, and she asked me if she could take on little thhings for me...so her daughter came to my house and we took several things to their stand - and I sold most of it. For the rest she is going to take it to another flea market for me. I did not know that you were there until I saw you, nor your friend C. Sorry so bad selling for you, but there was really no one around, was there. Most unusual, usually lots of folks on that day.